The WELCOME to the BLiNX WORLD! DVD was a special good distributed at the Commemoration Release Event. It contains demonstration clips and behind-the-scenes footage for Blinx: The Time Sweeper. ​It's a worthwhile watch for any Blinx fan. I highly recommend watching the whole thing, at least for what could be considered cursed imagery and dubbed Catherine. 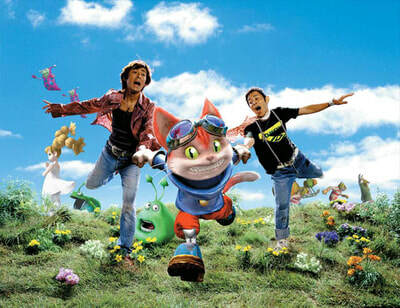 ​Description: Contains DVD cover scans, CD scans and the video file. Ripped by Emmett Eon. After you watch the DVD, feel free to read my personal time-stamped notes below. 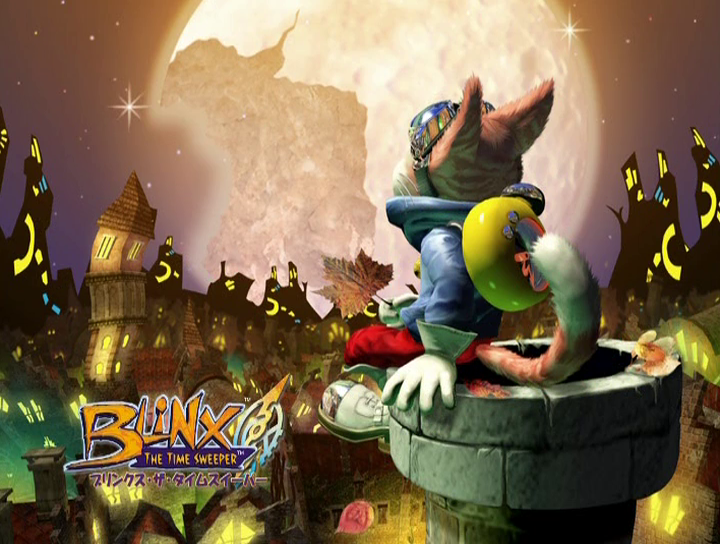 2:32 - Main showcase of Blinx: The Time Sweeper. Dubbed Catherine is a thing now. Catherine briefly explains the Time Controls. 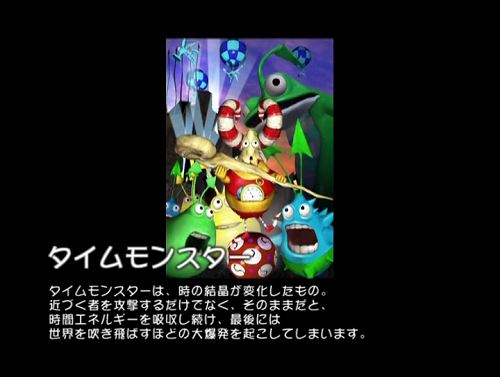 3:35 - Slideshow of key art. 3:31 - Catherine, producer Katsunori Yamaji and test lead "super player" Utako Tanaka talk about the game. 5:26 - Shiny 3-D renders of the time crystals. 7:40 - Demonstration of two solutions to the first double door puzzle. 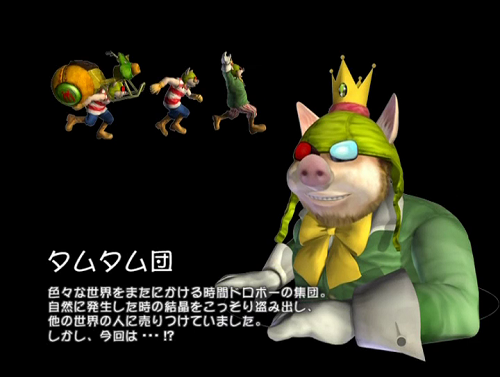 10:04 - Renders of the Time Monsters. 11:05 - Backflips for days. 12:18 - Message from Katsunori Yamaji on the game's development. 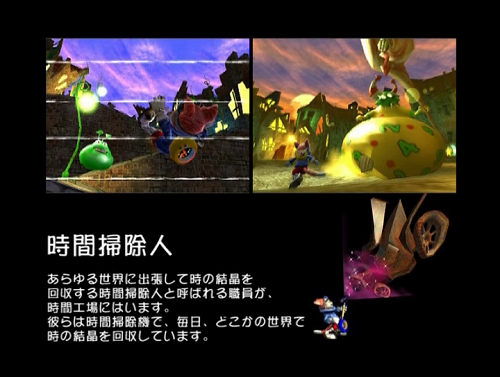 16:00 - Game's introduction cutscene. 19:30 - Promotional clip, primarily focusing on Time Controls. Blinx appears to be doing the voiceover. 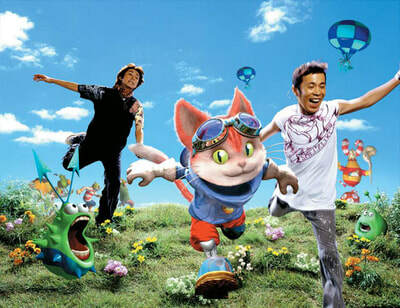 24:27 - The making of the TV commericials that aired in Japan, Christmas magazine spread and DVD cover. 24:41 - The Blinx cosplay seen at Tokyo Game Show 2002, holding one of the TS-1000s used at the Commemoration Release Event. 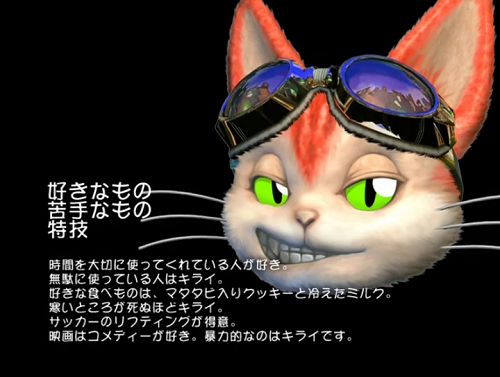 25:33 - High-quality boards of Blinx's "emote" renders. 25:51 - Closing slides. Features key art including some of the Blinx emotes and never seen before key art. "Time" is made in the Time Factory in another world. It monitors the flow of time it sends, and if there's a problem, it's their duty to go to that world and fix the time flow. The infomation pertaining to the location of the Time Factory is as helpful as always, better than "somewhere". 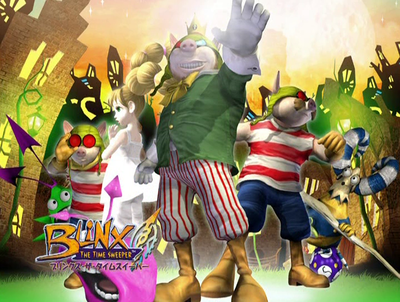 In Blinx: The Time Sweeper, time is created in the Time Factory but in Blinx 2: Masters of Time and Space, the Goddesses create time. 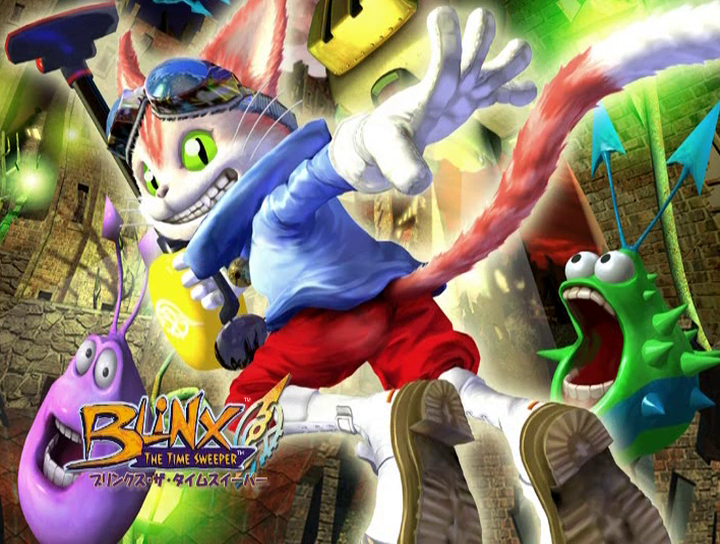 It remains as one of the biggest inconsistencies in Blinx canon. 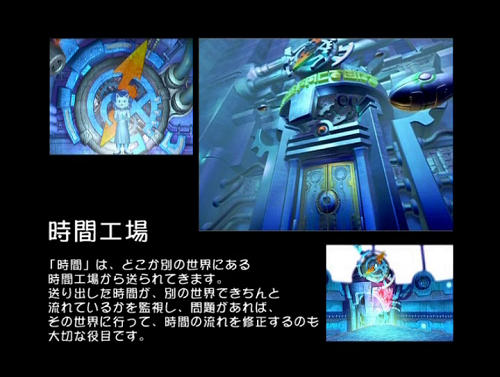 There are workers called Time Sweepers at the Time Factory, who travel to every world and collect time crystals. With their sweepers, they collect time crystals in other worlds every day. Guess you could say that Time Sweepers are working around the clock​. Of note is that the word used for "they" is usually used to refer exclusively to males. Blinx is a Time Sweeper in training. Based on the power of the time crystals he's collected, he hasn't been one for long, but he's proficient in manipulating time. He's not worried about whether he'll move up further in the ranks, but he has some misgivings about his work and wants to become a fully fledged Sweeper soon. 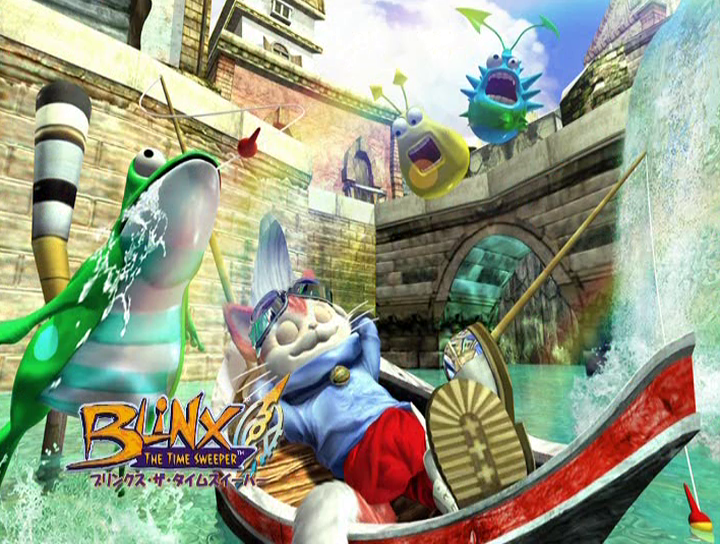 It appears that Blinx was still in training at the time of the World B1Q64 incident. 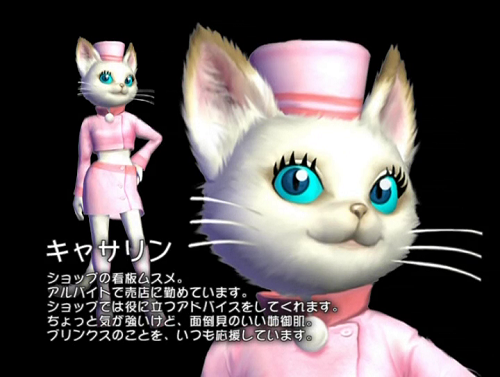 This is also supported in the JPN TTS manual where Blinx comments "gotta remember this for the exam". 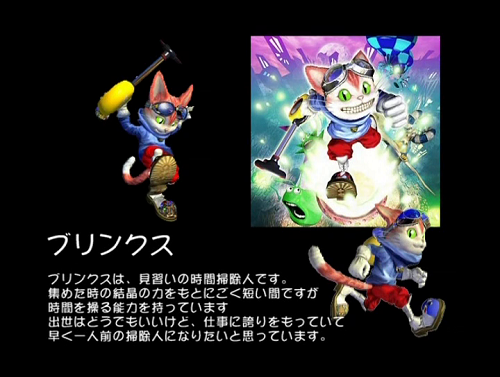 The most interesting characterisation here is that Blinx seems to have had some doubts about his abilities as a Time Sweeper. When he sees someone in need, he has to help them. He's a bit clumsy, and others see him as laid back. However, he's actually very strong-willed and won't give up when he sets his sights on something. Has a positive personality. Quick to forget about things that bother him. Acts on his instincts. 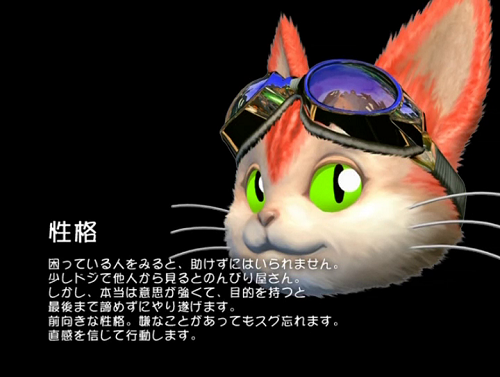 The section delves into parts of Blinx's personality, some traits not evident in-game. His clunsiness and laid back nature could be expanded into his relationships with his superiors and peers during training. Likes people who use time wisely. Doesn't like people who waste it. Likes cold milk and cat powder [basically Eastern analogue to catnip] cookies. Hates cold places as much as death itself. Likes comedy movies. Doesn't like violent stuff. Clearly the video game character we deserve. A princess living in World B1Q64 that is a species similar to our own. Taken hostage by the Tom Tom Gang. As of now, there is still no mention of Princess Lena or the inhabitants of World B1Q64 actually being human. A group of time thieves that travels across many worlds. They sneakily plunder naturally produced time crystals, and sell them to people in other worlds. Interesting that it specifies that they don't normally break time themselves, and it actually says that they sell the time crystals to people (not just "worlds"), though it seems like B1Q64 and 5J7A are cases of them deliberately breaking time instead, leading to all the chaos. A girl that attracts visitors to the shop with her looks. Works the store as a part-time job. Gives helpful advice in the shop. A bit strong-willed, but has a feminine sense to care for others. Always gives Blinx support. Well, they're certainly upfront about her looks, for one. 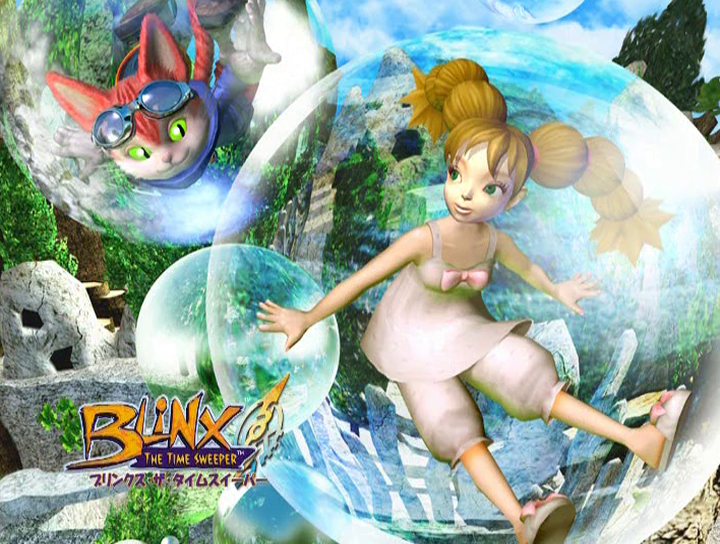 Also seems to imply she already knows Blinx (which you might have taken as implied by her referring to Blinx by name in Round 9 anyways). Her job being part time falls in line with existing implied canon of her becoming a full-fledged nurse by MOTAS. Time monsters evolve from time crystals. Not only do they attack anyone that comes near, but if they're not dealt with, they'll continue to absorb time energy, and finally explode, destroying the world. Nice to have have the specifics. it's bestowed upon all by nature. manipulate it however you wished?